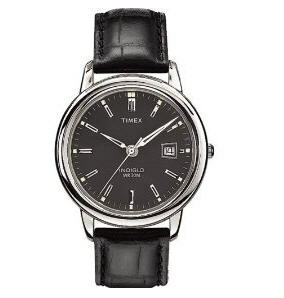 Add classic style to your everyday couture with the Timex T21752 stainless steel men's watch--a great match for business or casual wear. 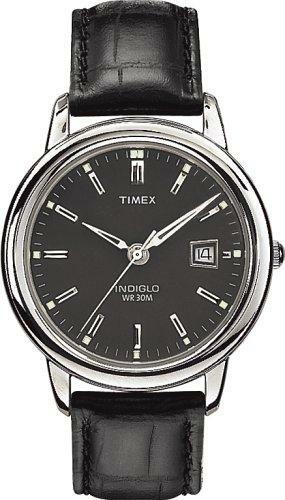 It has a large, round watch case has a highly polished, slightly raised bezel that frames a gray dial background. It also has silver stick dial markers, thin, luminous baton hands, and a date display at 3 o'clock. With the Quick Date function, you can set the date on the watch without turning the crown for every 24-hour period. Just pull the stem halfway out, and turn until desired date is reached. This watch is also water resistant to 50 meters (165 feet). It's completed by a genuine leather band in black with crocodile texturing. Other features include a 10-year battery life and water resistance to 30 meters (99 feet). The Indiglo night-light uniformly lights the surface of the watch dial using patented blue electroluminescent lighting technology. It uses less battery power than most other watch illumination systems, enabling your watch battery to last longer.